I finished piecing 45 of the 90 blocks I need for the Christmas gift quilt I'm making. I was going to post a shot but I thought better of it in case the recipient views my blog. Instead, I found a fun photo on the camera from early this summer to share. 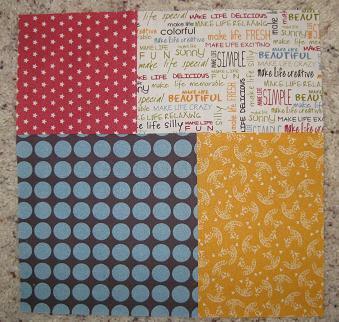 This is a block from the quilt I was making with a fat quarter bundle I got for my birthday. I pieced all the blocks but have yet to sew them together. This will be a fun project to get back to after winter has dragged on for too long! Notes: The pattern for this block is "Megabits" by Swirly Girls Design. The fabric is from Moda's "Make Life..." collection. And I didn't cut my shirt this time!